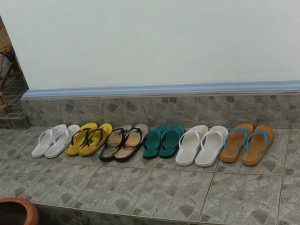 Its very common to see rows of shoes or flip flops (which by the way are called “slippers” in Sri Lanka) lined up outside the front door. Also it’s not polite to point the soles of your feet at people. If you’re sitting on the floor, go cross legged or put your feet flat on the floor. You will almost always be offered tea, and likely something to eat. By the way the tea will be the most sweetest thing you will ever drink in your life. It’s normal for Sri Lankan’s to have tea with 5 or 6 spoon fulls of sugar in. When you ask, “please no sugar”, firstly you get get a funny look and secondly they will put some in, anyway just for good measures. It’s wise to accept this gesture as a sign of interest. If you don’t want something, you will be asked a number of times – again, this is just to show hospitality. You may need to be firm in refusing. Always take something when you visit a Sri Lankan home. Biscuits or a very small souvenir from home (such as a couple of pens or postcards) will be much appreciated. However, don’t expect people to mention or open the gifts, or even to say thank you. It’s not the done thing.